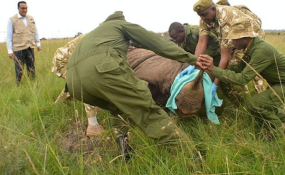 When the Kenya Wildlife Service (KWS) started moving 11 rhinos to Tsavo East National Park on June 26, Tourism Cabinet Secretary Najib Balala stood a few meters away as reporters snapped pictures of the critically endangered animals being prepared for transport. On Thursday last week, he stood before reporters in Nairobi and announced that 10 of the 11 black rhinos--estimated at 5,000 worldwide and just over 700 in Kenya - had died due to "saline water" at their new home. Naturally, the reaction by most Kenyans was of outrage, and many demanded action. They wanted to know how the minister had supervised the translocation of the animals before something as basic as salt levels in water at Tsavo East had not been considered. The murky situation was made even worse when renowned conservationist and former KWS chairman Richard Leakey revealed that the board he chaired had thrice advised against the translocation, raising queries about the ability of the park to house the endangered animals due to lack of enough vegetation, and the presence of too much salt in water. Dr Leakey also said that when the animals were moved, KWS did not have a board and in the absence of the critical organ, the ministry makes decisions on behalf of the wildlife agency. But even with all these questions, and calls for his resignation for what critics say was dereliction of an important duty, Mr Balala does not think anyone should question him. In fact, he said, the only person he will be answerable to was President Uhuru Kenyatta, the man who appointed him. All the others "can go to hell", he thundered defiantly in Mombasa on Monday. "In my leadership, I decided that I am going to be right and not nice. On the issue of rhinos, I am going to stand with what is right," he said. "Nobody has appointed me; it is President Uhuru Kenyatta who appointed me, so they can go to hell. I can tell them that." After losing his bid to be Mombasa senator in 2013, Mr Balala, who had been named as one of the four faces of the Jubilee Party, wormed his way to the inner circle of government, with an appointment as the first mining Cabinet secretary, before being moved to tourism. Mr Balala's "go to hell" is a stand that many, including the parliamentary committee on environment, think is misplaced. "We saw Mr Balala supervising the translocation of these rhinos, he was part of it. So at the end of the day, he cannot [blame] junior officers," said Maara MP Kareke Mbiuki, the chairman of the committee when he invited the minister for a meeting with Parliament Tuesday morning. "We are seeing conflicting [reports] from the former board led by Mr Richard Leakey, management of Kenya Wildlife Service and from the CS himself. But Kenyans want to know what happened and put this matter to rest and know who is responsible," said Mr Mbiuki. Online, outrage greeted Mr Balala's "go-to-hell" comments, with Kenyans pouring out their anger. "No! @tunajibu, CS Najib Balala, I have a lot of respect for you. But with all due respect, however much you consider some Kenyans or groups misguided, you by virtue of that position should NOT tell them "to go to hell"!. The President appoints you on behalf of the Kenyan people!" 2013 presidential candidate Prof James Ole Kiyiapi said on Twitter. Unionist Dr Ouma Oluga said: "Balala's 'Go to hell' comment aimed at concerns and critics is bad for public service accountability and public service responsibility. All state and public servants must know they owe every one answers, not just the appointing authority. Please @UKenyatta let him Go to Hell." Twitter user @waambui, quipped,: "So Najib Balala thinks that he is only accountable to President Uhuru and not to Kenyans? Because his salary is paid using Uhuru's savings or his ministry is under Brookside Dairies?" Appearing on NTV's AM Live on Tuesday, Kiambu Senator Kimani Wamatangi called on Mr Balala to calm down. "You have to re-wire your fuse. If you show people you are short-fused, it tells a lot. I think he is best advised to take that route (calm down)," said Mr Wamatangi.